No, we are not parrotheads that hunt. We are hunters that seek to thin the parrothead flock (or phlock as they seem to prefer to spell it). Parrots are cute birds, why would you want to kill them? We hunt parrotheads, not parrots! Well then, what is a parrothead? 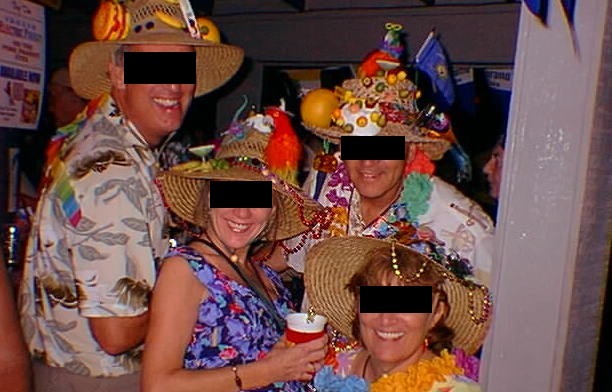 Parrotheads are to Jimmy Buffett what Trekkies are to Star Trek...people who have given themselves over to worship of a particular entertainer, often to the exclusion of all else in life. They are so wrapped up in their cult that when they come to Key West, they completely forget to tip! How does one spot a parrothead? Just as Trekkies have distinctive uniforms, parrotheads have unmistakable characteristics. First, look for strange homemade hats, often containing plastic fruit, tropical flora, stuffed parrots, and cheesburgers...hats you wouldn't wear on halloween. 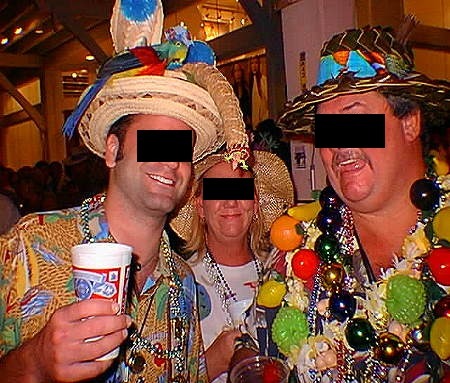 As you can see, cheap plastic beads are often seen around the necks of their loud Hawaiian shirts, and they are almost always holding a drink, however these last characteristics are not unique, being seen on many sub-species of the Key West tourist. More definitive, though, are the "hard copy"...laminated fake backstage passes hung from lanyards around their necks...apparently this makes them feel like they are elite enough to be backstage at a Buffett concert. Aren't you afraid you will deplete the stock of parrotheads Yes, this is a matter of great concern to us, we'd hate to see our hobby curtailed due to a lack of prey. The results of a recent study of the ecology of the parrothead is of particular concern to us. Researchers from a leading university were unable to identify the method of reproduction of the parrothead. 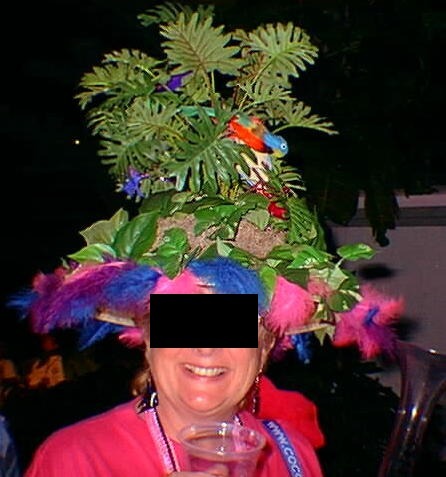 It seems that virtually all parrotheads are too old to reproduce, the few females that are still of child bearing age are invariably mated to males that are always too drunk to perform, and young parrotheads are rarely seen! Still, each year there seem to be more, so for now we are just watching the situation closely. We are planning on a licensing system to monitor the catch, and should it be needed, we are prepared to implement bag limits. Why do you hate Jimmy Buffett? Who said we hate Jimmy Buffett? Many of us like his music (at least the early stuff). 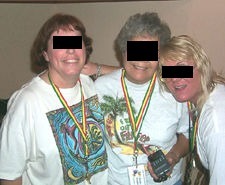 In fact, we were even there when he made an appearance at the 20th anniversary of the opening of Margaritaville. What we take exception to is the way he created a poorly-tipping cult which has invaded our island. Worse, once the cult got out of control, he left town for quieter sourroundings (West Palm Beach), but left us with his followers. Where's the sport in hunting something that is brightly colored, congregates in large, slow moving herds, and is too drunk to be aware of its surroundings? Just as a deer hunter may progress from sitting in a blind above an artificial feeding station, to stalking a deer with a bow and arrow through an open field, so too does parrothead hunting provide an easy stepwise progression as proficiency rises. OK, I bagged my first parrothead. How do I skin it and prepare it for mounting? We have prepared a complete tutorial of the process. It is quite graphic, and not for the squeemish...if you think have the stomach, and are at least 18 years old, click here. I'm a parrothead, and proud of it! I think this is the lamest site I've ever seen! Well, all we can say is, in the immortal words of William Shatner to the Trekkies in the infamous Saturday Night Live skit, "GET A LIFE"! Or at least, when you come to Key West, remember that locals make their living on tips, and 15-20% is customary, not the parrothead average of 5%! Send complaints, suggestions and comments to the webmaster.